With Sim Dynasty baseball, you act as the Owner, GM, and Manager of a Major League Baseball team all rolled into one. Let's take a quick look at some of the features of the game. 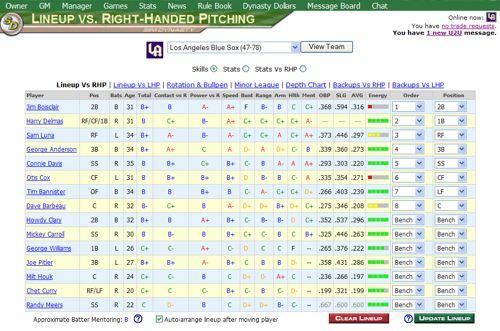 You can set your lineup for when you face left handed or right handed pitching, set up your rotation and bullpen, and manage a team of up to 25 minor leaguers - deciding which prospects coaches should pay extra attention to. Sim Dynasty Baseball is amazingly realistic. With over sixty coaching stratagy options it puts you in control of your teams destiny. The more coaching you put into it, the more wins/championships you get out of it. My favorite part is the 'Dynasty Vision' where I watch each game unfold. The Sim Dynasty CEO is the most hands-on and helpful host on the web. I tell all my friends about this game.